This week saw the announcement of Oppo’s pair of upper-midrangers, the R7 and R7 Plus, and we had a brief hands-on time with the phones to gather some initial impressions. The smaller of the duo, the Oppo R7 comes with a 5-inch 1080p AMOLED display, which a casual outing with the phone proved very nice in the sun. There’s no bezelless trickery on this one, instead it’s a rather typical Oppo styling. The all-metal unibody is very well made though, and feels smooth to the touch. The Snapdragon 615 coupled with 3GB of RAM delivers snappy performance, but the R7 still boots Android KitKat 4.4, even if an update is in the works. There a 13MP camera on the back with phase detection autofocus, and another 5MP unit on the front for narcissistic purposes. 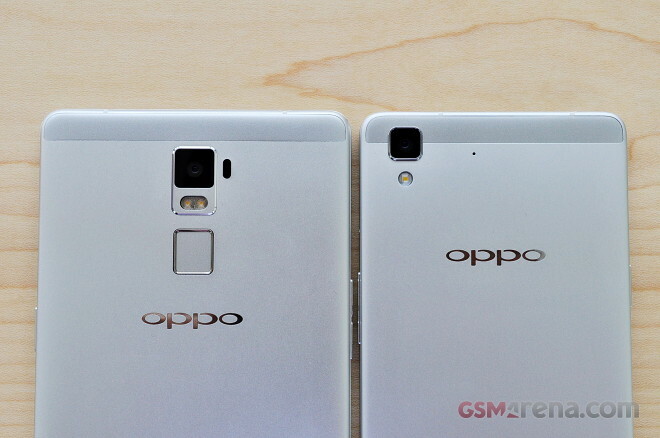 So what do you reckon, is the Oppo R7 hot or not? The Oppo R7 Plus ups the ante and comes with a 6-inch screen, a 1080p AMOLED panel too. When it’s off it creates the impression of an edge-to-edge display, but the magic vanishes once it’s powered up. Still, it’s a very upclass looking device, even more so than the 5-inch model. The chipset and RAM may be the same, but the R7 Plus is better equipped in the imaging department. It packs a 13MP sensor too, but it’s of the RGBW variety and Oppo claims it delivers significantly less noise and improved light gathering capability over conventional designs. It will be aided by a laser autofocus mechanism, as well as a dual-LED flash over the R7′s single LED. The latest must-have feature of the year, the fingerprint sensor joins the camera assembly on the back of the device. This one does boot Andoid Lollipop, with Oppo’s latest Color OS 2.1 on top.